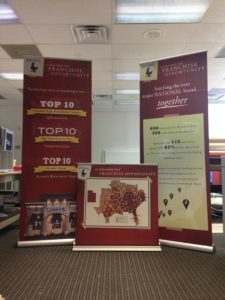 The Sign Brothers can help you conceptualize, design, build, and set up custom tradeshow displays and other display signage. It always starts with a conversation. Depending on how often you’ll use the displays and how much impact you need, we’ll find a product to fit. Then, we’ll design it for you. With your input, our talented design staff will make sure the design engages your target audience. Our veteran project managers know exactly what kind of stands, accessories, and hardware your signs will need in order to last and include them in each project. With The Sign Brothers, you can rest assured you’re signs are constructed correctly for maximum stability and longevity. Speak with a project manager about your display signage project today.